Sunday series is extra early growing and extremely high producer and well suited to winter production. Sunday consists of Violet and Lavender. The series is also resistant to Botrytis. Branches grow upright and form an excellent shape. Prime series is early flowering and suited to winter production. The series is well branched with small wings and its strong stems grow upright. Crops are easy to harvest. Prime series is a very high producer. Earth has big calyces which open well. It produces tall and very high quality stems that grow upright and straight into a perfect shape. Crops are easy to harvest and are suitable for winter production. 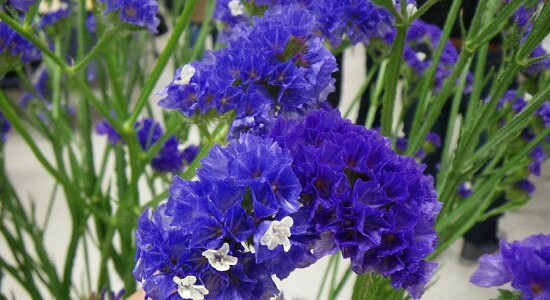 Exotic Tall Blue is a middle-late flowering variety and suited for summer production. It produces high quality stems not only for 1st flush but also 2nd flush with long stems and good branching habit. Apply less fertilizer and water as the growth is very vigorous. Intense violet color. Large brush and thick stems give heavy quality to cut flowers. Good stem length and branching even under the hot climate condition. It is late flowering speed and suitable for summer production. Noble Violetta has very intense dark blue brushes. The variety belongs to middle-late flowering speed category with excellent summer performance producing high quality stems. Luster Amethyst has shinning bright purple calyces that open very well. Excellent volume with big brushes. This variety is slightly slow and suitable for summer production. Rose Wine is an early flowering variety suited for winter forcing cultivation. Calyces open very well and stems grow straight up. Vivid intense rose color. Attractive bright lemon yellow variety with perfect volume and suitable for all seasons. Crystal yellow is susceptible to botrytis so good ventilation and appropriate prevention are required. Clear Snow is pure white and an early flowering variety suitable for winter production. The variety has an upright branching habit making cropping easy. Sprint Violet is selected for very early flowering, very high yield, its intense dark blue flowers and mainly winter production. The variety does require much less cold for vernalization. F1 Smash series grows much more uniform than OP varieties and almost all flower stems are harvestable without loss. Productivity is very high and comparable to TC varieties. The series is early for winter production. Ever series offers wide of planting schedule as it does not require much cold. Ever Snow is pure white with slender plant shape ; excellent for the mixed bouquets. Ever Cute has an excellent volume. Ever Rose has the lowest requirement of cold temperature for flower initiation in our red varieties and it allow this variety an advantageous production with high quality flowers. Our offer is limited to north hemisphere from April to September and south hemisphere from October to January. Miyoshi’s well known hybrid Limonium, Tall Emille and Tall Pink Emille. These two varieties are free flowering and continue to flower under the right temperature and light conditions.